A blood-red moon dazzled star gazers across much of the world on Friday when it moved into Earth's shadow for the longest lunar eclipse of the 21st Century. The total eclipse lasted 1 hour, 42 minutes and 57 seconds, though a partial eclipse preceded and follows, meaning the moon will spend a total of nearly 4 hours in the Earth's umbral shadow, according to NASA. In Nairobi, Kenyans watched as the moon darkened. "This is what life is all about: Magical moments like this," said Teddy Muthusi as he watched from Uhuru Park in Nairobi. "It's just beautiful. It's well worth it." On the banks of India's Ganges, temples were closed ahead of the eclipse. Enthusiasts watched through telescopes at the Marina South Pier in Singapore and at the Al Sadeem Observatory in Al Wathba near Abu Dhabi. Hundreds of people in Australia paid to watch the eclipse from the Sydney Observatory before sunrise. When the moon moved into the conical shadow of the earth, it went from being illuminated by the sun to being dark. Some light, though, still reaches it because it is bent by the Earth's atmosphere. 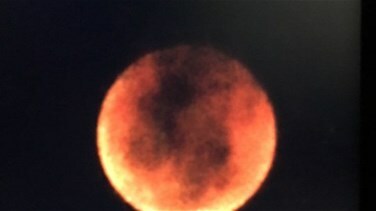 "It's called a blood moon because the light from the sun goes through the Earth's atmosphere on its way to the moon, and the Earth's atmosphere turns it red in the same way that when the sun goes down it goes red," Andrew Fabian, professor of astronomy at the University of Cambridge, told Reuters. "It is a very unusual coincidence to have a total lunar eclipse and Mars at opposition on the same night," said Robert Massey, deputy executive director of the Royal Astronomical Society, who watched the eclipse from the Mediterranean Sea. For thousands of years, man has looked to the heavens for omens of doom, victory and joy. The Bible contains references to the moon turning into blood and some ultra-Orthodox Jews consider lunar eclipses ominous and a cause for moral contemplation. According to some Hindu beliefs, celestial bodies such as the sun and moon emit negative energy during an eclipse and so some temples in India were closed to minimize any disturbance. Astronomers, though, said there was no cause for worry. "There is no reason to believe that blood moons foretell doom," said Massey. "This does not herald the apocalypse: seeing a lunar eclipse and Mars in the sky is something people should enjoy rather than worry about." The next lunar eclipse of such a length is due in 2123. To watch the full report, please clcik on the video above.